Kelley discusses Mannaz and the connection between animism, the concept of "Middle World," and how they relate to direct relationship. Kelley discusses Ehwaz as a challenge to fragility. Kelley discusses Berkana, coming back from berserker mode, and self-care. Kelley opens the year's discussion of the third aett with the survivor rune, and how it informs us on grief. Kelley discusses closing 2019's experience of the second aett and how it prepares us for the third aett. Kelley discusses Sowilo and the Divine duty of paying it forward, and how Ehwaz reversed cautions us to stay deep--in our lane. Half-month Perthro and luck, the blank rune, and initiation. Kelley discusses the runic new year, Fehu, and the first aett. Episode 22: Shaman or Therapist? Kelley discusses the initiation of the sacred seed, which started late last year and culminates next week. Kelley discusses rune resources to love, and ones to lose. Kelley describes acquiring her first new rune set in 14 years. How do you come into relationship with an oracle? Listen to Kelley's experience of finding and growing with the runes. Kelley answers questions on correct reading direction, half-months runes, and runic calendars. Kelley discusses what soul calling really is, how to claim it, and what it means to do so. Kelley Harrell discusses reversed runes in casts, and the personal challenge they pose. Episode 8: What is Shamanism? Kelley Harrell discusses shamanism as a calling, choice, and initiation. Kelley discusses how she reads the runes, setup through process. Are the runes meant to be used as divinatory tools? What do history and Kelley say on the matter? Creating a personal theme for this Mother Night, to carry from Winter Solstice into 2018. 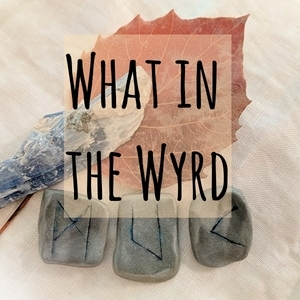 What's in your wyrd? Listen, and learn how to affect it.